Indigenous Visual Culture at OCAD U welcomes Barry Ace as the winter 2018 Nigig Visiting Artist-in-Residence. He will be on campus from January 9 to February 6, 2018. Barry Ace is a practicing visual artist who currently lives in Ottawa. He is a band member of M’Chigeeng First Nation, Manitoulin Island, Ontario. His mixed-media paintings and assemblage textile works explore various aspects of cultural continuity and the confluence of the historical and contemporary. 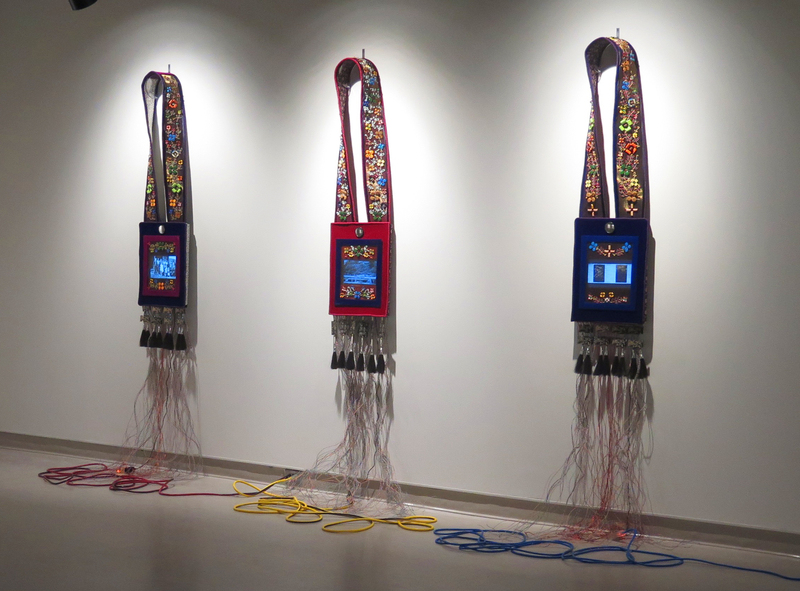 The Nigig Visiting Artist Residency supports the dynamism of Indigenous contemporary art and design practices and is a tremendous educational opportunity for the artist and students. Faculty interested in scheduling a classroom visit with Barry Ace may email the Nigig Visiting Artist Residency coordinator Vanessa Dion Fletcher – vdionfletcher@ocadu.ca after January 3, 2018. INVC Student Centre 12 p.m. to 2 p.m.
As a practicing visual artist, Barry Ace’s work has been included in numerous group and solo exhibitions, including: Emergence from the Shadows – First Peoples Photographic Perspectives, Canadian Museum of Civilization (1996: Ottawa); Urban Myths: Aboriginal Artists in the City. Karsh-Masson Gallery (2000: Ottawa); The Dress Show, Leonard and Ellen Bina Art Gallery (2003: Montréal); Super Phat Nish, Art Gallery of Southwestern Manitoba (2006: Brandon); Playing Tricks, American Indian Community House Gallery (2006: New York); m∂ntu’c – little spirits, little powers”, Nordamerika Native Museum (2010: Zurich); Changing Hands 3 – Art Without Reservations, Museum of Art and Design (2012-2014: New York); Mnemonic Manifestations, Latcham Gallery, (2015: Stouffville); Native Fashion Now: North American Native Style (2016 – 2017: Peabody Essex Museum, Massachusetts and various US venues), Every. Now. Then: Reframing Nationhood, Art Gallery of Toronto (2017: Toronto); Anishinaabeg: Art & Power, Royal Ontario Museum (2017: Toronto); Insurgence / Resurgence, Winnipeg Art Gallery (2017: Winnipeg); raise a flag: Works from the Indigenous Art Collection (2000-2015) (2017 Toronto), 2017 Canadian Biennial, National Gallery of Canada (2017: Ottawa). He is the recipient of the KM Hunter Visual Artist Award for 2015.